Including more fruits in your diet can lower your risk of heart disease, diabetes and certain cancers, according to the U.S. Department of Agriculture. Most healthy adults need 1 1/2 to 2 cups of fruit a day. 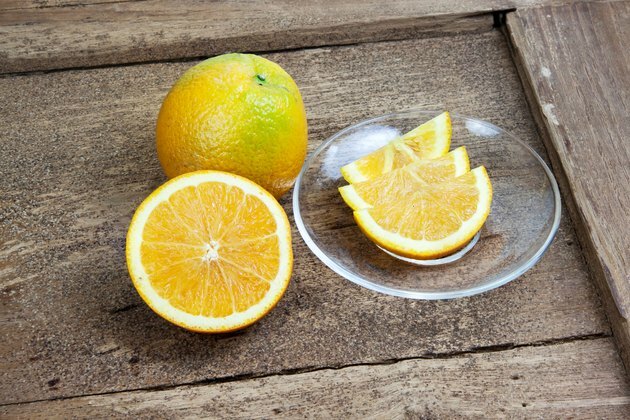 Navel oranges make a healthy fruit choice as they are low in calories and high in fiber, potassium and vitamin C.
As a food item packed by nature, it can be difficult to determine the exact serving size and calories per serving of a navel orange. According to the USDA Nutrient Database, a 2 7/8-inch diameter navel orange contains 69 calories. Each 2 7/8-inch diameter navel orange contains 17.5 g of carbohydrates, 3 g of fiber, 1 g of protein and less than 1 g of total fat. Carbohydrates turn into glucose during digestion and act as a source of fuel for your cells. The USDA recommends 45 to 65 percent of your total calories come from carbohydrates. Fiber is a type of carbohydrate that helps alleviate constipation, control hunger, lower cholesterol and improve blood sugars in diabetes. Healthy women need 21 to 25 g of fiber a day, and healthy men need 30 to 38 g of fiber a day. A diet that includes rich sources of potassium can improve your heart health. The American Heart Association recommends healthy people consume 4,700 mg of natural potassium a day to help control blood pressure. One navel orange contains 232 mg of potassium. Talk to your doctor about your potassium needs; some illnesses, such as kidney disease, require a potassium-restricted diet. One navel orange contains 82 mg of vitamin C. Healthy adult men need 90 mg of vitamin C a day, and healthy adult women need 75 mg of vitamin C a day. Vitamin C is required for the synthesis of collagen, a structural protein found in your skin, tendons and ligaments. It is also an important antioxidant that protects cells from free radical damage, and may help prevent the onset of heart disease and certain types of cancers. Adequate intakes of vitamin A helps to promote vision health, normal growth and development and immune health. A navel orange contains both vitamin A and beta carotene. Beta carotene is a form of vitamin A that has antioxidant properties. Beta carotene is responsible for the color of the orange. Healthy adult men need 3,000 IU of vitamin A a day, and healthy adult women need 2,310 IU of vitamin A a day. One navel orange contains 346 IU of vitamin A. Is Eating Fruit for Breakfast Healthy?